The Camp Triumph boat is coming along nicely on schedule, so I've decided to build a SOF (skin on frame) Yost Sea Flea 11' for my little buddy Tucker. 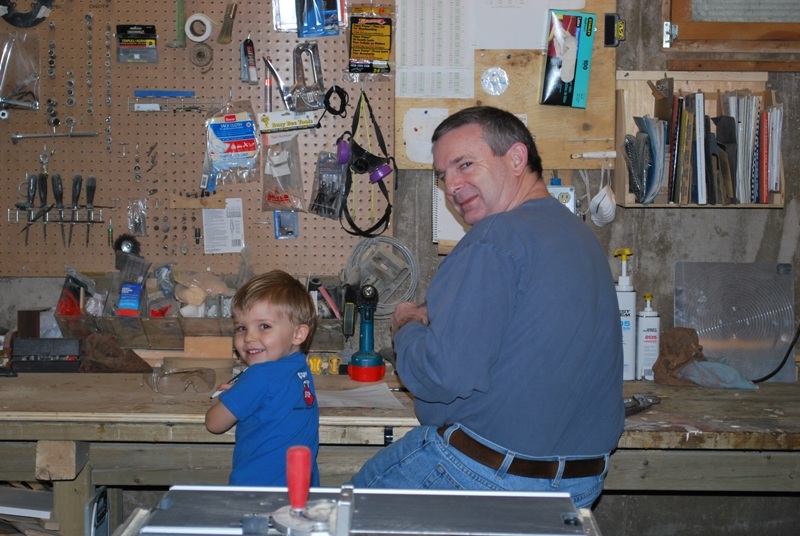 He spends a lot of time with his grandfather in the boat shop, and often asks when I'm building his kayak. I think I can complete this one quickly and still start on my own boat by July. This is Tucker and Buhka in the shop. (He's the blond guy). He'll be 5 this year, and has grown a lot since this shot, so I think the Sea Flea 11 will fit him now and for a few years. This kayak is going to be a surprise, so don't anyone tell Tucker! He'll eventually figure it out when I start building it . Once he knows, he can help. This is the build log for a Yost Sea Flea 11' SOF I'm building for my grandson Tucker. Tucker_1 Forms pdf (8.86 kB), or E drawing of forms (5.17 kB) with all the forms to scale. I had this printed at my local print shop, $5, well worth it rather than doing it the hard way. Feel free to use this if you're building one of these. I considered several fabrics, but in the end chose to go with 8 oz. polyester from KudzuCraft, mainly due to the excellent how-to videos on this site, and reading a lot of pros and cons about fabrics on the Kayak Forum. This is my first SOF so I don't want to take chances. I did trade emails with a guy locally who builds SOF's. His web page shows they're boats at Cape Split, a very special local site. They've used 10 oz. cotton duck canvas. When time and shop space permit, I'll cut the forms and get a strongback set up. Jumping ahead a bit, here's the finished kayak delivered to a happy little guy. The first cruise with Dad and one of his dogs, Taylor. I also added a YouTube video on how to construct these training stabilizer floats.